Data security is a major issue of today’s digital age. With hackers using sophisticated software and tools to creep through domains, it’s crucial that you prioritize the safety of your website right at the start. This way, you won’t be an easy target of cybercriminals. Plus, you can protect your information as well as your clients’. First off, don’t post details online that you don’t want other people to steal and misuse, such as your Social Security Number (SSN). Your website will need the name of your company, the address, contact number, and even your name and email as the owner. However, you don’t need to include your home address, personal mobile number, and other data that aren’t relevant to your business. It’s so easy to perform a reverse phone lookup with Google. You just need to type in the number, and a list of people or companies associated with those digits pop up. It’s no cause for concern if a customer uses this search method to find your business, but it’s an entirely different situation if someone gets a hold of your number and uses it to stalk you. The service that enables organizations or individuals to create a website or web page on the Internet is called web hosting. Companies in this industry provide the tools necessary for the creation and publication of the domain. Data on the sites are stored on servers that have massive computing capacities. It’s vital that you find a secure web host so as not to endanger the information you have on your pages. Backup and Restore – While it may seem redundant, backing up your data is a security element that allows you to retrieve the latest copies of the system in the event of an information wipeout or attack. You should know the host’s backup schedule and restoration policies to see if they align with your expectations. Network Monitoring – A reliable web host also conducts regular checks on the internal network and must be able to alert you in cases they’ve spotted intrusions and unusual activity. DDoS Prevention – Distributed Denial of Service (DDoS) are attacks that occur when a considerable amount of traffic is sent to your domain. This tactic makes your website useless to visitors and can make you lose money on revenue. Your provider should be able to put up sturdy firewalls and other measures to prevent this attack from happening. Virus and Malware Removal – Potential web hosts must be able to give you their process of scanning viruses and malware as well as how they remove them. High Availability – An excellent service provider can keep your site running 24 hours a day, seven days a week. This feature includes having backup hardware in place in case the main one malfunctions and multiple servers to balance the load. User Permissions – The web host should allow you to create different levels of permissions for various users. Not all of your employees need to know what goes on at the host level or gain access to all files. Secure Sockets Layer (SSL) certificates are data files that digitally attach a cryptographic key to a website’s details. Once these are installed on a web server, it sets off the padlock and https protocol and enables protected connections from the server to your customer’s browser. It guards data transfers and logins on your site to alleviate your worries over cybersecurity threats. To determine if a website has an SSL certificate, look at the URL. If it uses https instead of http, then the site runs on a secure connection. There’s also a lock icon right at the beginning of the address bar.You can buy the certificate from your web host or third-party companies such as Namecheap and QuickSSL. You must keep your software up-to-date to stay ahead of hackers who aggressively look for security flaws in popular web programs. Developers regularly check security holes on their apps and create patches to fix the issues. If you don’t update your digital tools with the latest patches, you make your website an easy target of cybercriminals. A secure website not only protects you and your clients’ information, but it also lends credibility to your business. It indicates that you’re serious about the welfare of your visitors and in safekeeping the data that they chose to share with you. 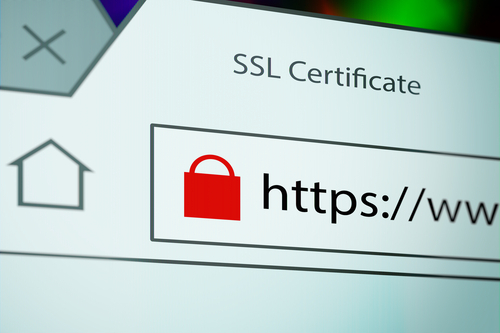 Plus, having an SSL certificate also boosts your Google ranking, which can lead to more customers.